Its cost me my entire energons. I was able to get through the Expert version with just Rhinox last time, but it took my whole team on Master. Is he much harder this time? Can anyone describe the fight, I’d like to prepare for the challenge! I haven’t seen anything on it! 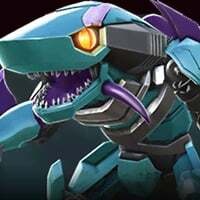 So I faced Megatronus the first time in Medium mode with a 3* duped Tech Sharkticon... The Tech Sharkticon’s Special 1 was Super Effective at Power Burn, stopping Megatronus from Launching Special Attacks. Almost got a perfect, but got sloppy at the end. Some of you more elite Commanders might have some thoughts as to whether or not this strategy is useful if you have a strong duped 4* Tech Sharkticon you can use against Megatronus in Expert/Master mode... BTW, I used the same Tech Sharkticon in the rematch at the end, unrepaired... did not win, but got Megatronus down to 8% health. Again, I was very sloppy with dodging/blocking in the battle. I just finished master. Wasn’t as bad as I feared... only had to revive my bots once. My best bot against Megatronus was Barricade. I have 2 Grindors so he gives me a double power lock to start the match. Then I just kept stealing his power with SP2 over and over. Aside from stealing his power, the key was hitting him with melee attacks for a full series and then bouncing backwards and counter attacking when his first melee missed. You just have to dodge ranged attacks sometimes until you can get in there with a round of melees. I also ran through expert first so I knew what I was getting into. That was much easier obviously, but it gives you a sense of what you are getting into. So he starts the match with the relic of fury, this doesn’t change until he gets down to 80% hp. Then he gets the relic of chaos, which is where most players are stumped I think. What it does is if your close to him for so long you take burn damage. It’s not that hard to deal with all you do is dash, hit him once, heavy, repeat. Bait specials as needed. Then he gets the relic of war at 30%, this gives him unstoppable when he dashes at you. Obviously the trick here is play aggressive enough to keep him from dashing at you. Then at 5% he gets the relic of immortality for 8 seconds or something close to that. Is he harder than the master Megatronus last month? One other point about Megatronus... in the first fight, he is his usual Demolition Class. However, when you face him the second and final time, he is not in any class. I guess Megatronus could buy some new relics, but he couldn’t afford class! Finished Medium, about to Rank Up my 4-Star Cyclonus to Rank 3, then start Hard once my energy is replenished. 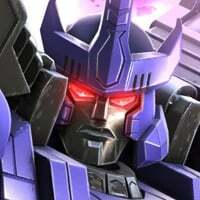 I’m currently at 25,500 Megatronus Chips, so just hit 25% towards 4-Star Megatronus. Can’t wait for the Megatronus Arena/Raids to start. 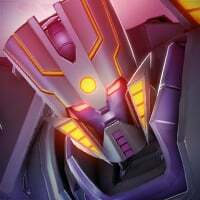 So if Megatronus is a god, who could actually be stronger? 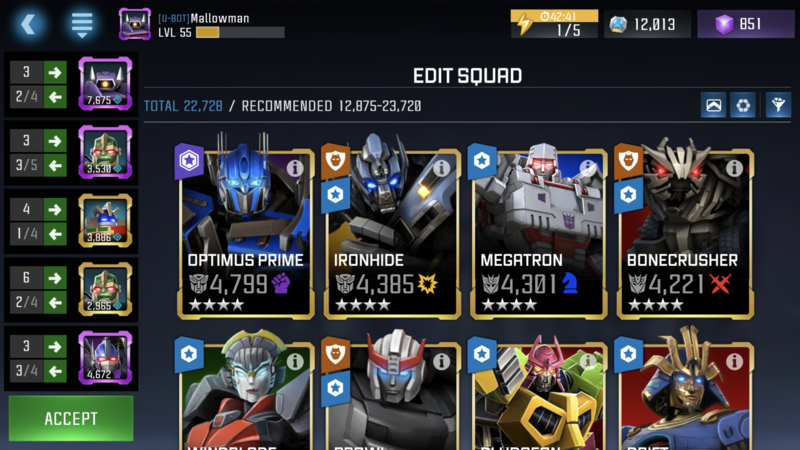 I ranked up my Arcee just in case the game story was trying to tell us something. I beat him yesterday kn master all up it took me 300 energon. For the demo one i used windblade and just rushed him like no tomorrow. For the second fight, drift was my main player and i just kept rushing with him. For the relic of chaos, go in for one hit and heavy, repeat, then relic of war just keep rushing. Thats Megatronus’s weakeness rushing. Blame it on lazy writing. Might as well let every "good" character throws a line to the Fallen like "hey you fake God! Eat my sword/punch/missle/laser rifle/sonicblast/etc! ", and the player clicks and clicks and clicks and finally chooses "skip" all the dialogs, LOL. What i have been noticing in these stories is that it is one sided. The autobots are always the good ones. Sure, megatron might have a bit more twisted ways of dealing with things but it is a war. Both factions goals want to achive peace. 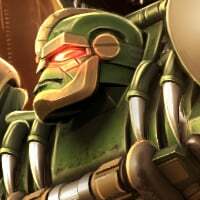 For one spotlight, make the decepticon the main faction. What goes on in the mind of a psychopath? What can be going on inside of Galvatron''s mind, that even Unicron fears him? Perhaps all the violence, all the bloodlust from the war, has made him have a disregard for life. Perhaps Unicron's Dark Energon has gone to his head and he lost his mind. Or perhaps Megatron is trying to dig his way out of Galvatron's phyche, wanting to get out ...Or maybe, just maybe, no one understands him. Cyclonus, Optimus, Starscream, no one understands him. The fact that his home was destroyed by a war he started, the fact that he has been sleeping on another planet for millions of years, and the fact that he sold his soul to the Devil (Unicron) has driven him over the edge, to the point where nothing else matters but destruction. After all, Galvatron was born from Megatron's destruction.... But now, Galvatron must fight hallucinations generated by his madness. Holy s*** expert Megatronus is AWFUL. You will need Cyclones for the second time you fight him. He's basically permanently unstoppable. This is my second attempt at it with this team. The Beast Purify works with two Rhinoxes? You just need two or more Beast Wars bots along with Primal. Yeah makes sense, that's all the description says. Interesting. Hi, everyone. Has anyone posted map breakdowns for this Spotlight? I'm really just looking for 3.1 now. Thanks in advance.